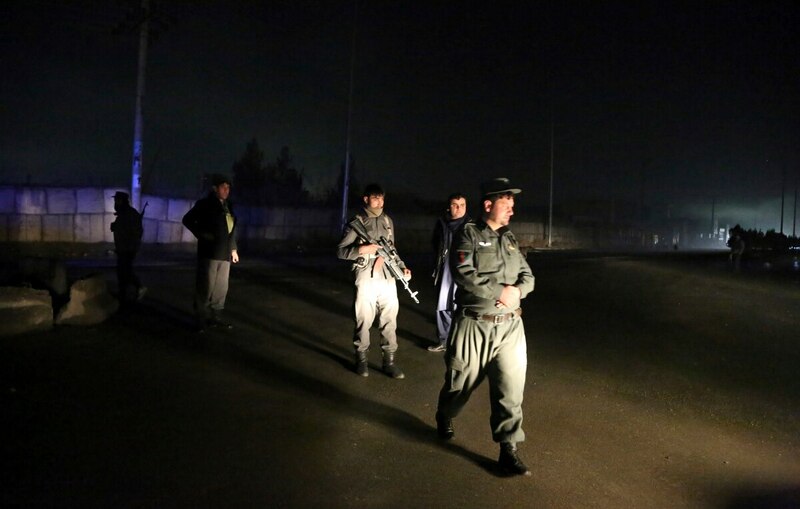 KABUL, Afghanistan — Taliban insurgents staged a coordinated attack Wednesday, targeting a security firm in the Afghan capital and killing at least 10 people and wounding 19 others. Meanwhile, U.S. officials said an airstrike hours earlier in Helmand province, which reportedly killed dozens of civilians, was conducted by American aircraft. The assault came hours after provincial officials said at least 30 civilians were killed along with 16 Taliban fighters during the overnight battle between Afghan government forces and insurgents in southern Helmand province. Many of them reportedly were killed in the U.S. airstrike. Most of the civilian casualties — which included men, women and children — came when the airstrike hit a house in the central Helmand River valley, a Taliban heartland, said a local official, Attahullah Afghan. U.S. officials said it happened in Helmand’s Garmsir district. The airstrike was conducted in self-defense after Taliban fighters armed with rocket-propelled grenades and heavy machine guns retreated into a compound and continued firing on Afghan government forces and their American advisers, said U.S. military spokesman Maj. Bariki Mallya. A gap in security assistance between Army unit rotations is raising concerns. "In self-defense, the ground force called an airstrike," Mallya said. "After the strike, there were secondary explosions, we assess from explosives inside the compound. At the time of the strike, the ground force was unaware of any civilians in or around the compound; they only knew that the Taliban were using the building as a fighting position." Mallya declined to say what the U.S. knew about civilian casualties or whether the incident was under U.S. investigation. In a prepared statement, he said the U.S. investigates every "credible allegation of error and reviews every mission to learn, adapt and improve." A statement from the governor's office in Helmand confirmed that 16 Taliban insurgents were killed and said that an investigation was underway to determine the number of civilian casualties.